Firefighters survey the aftermath after the five story Waddell Furniture Building at Prairie and Fannin burned to the ground in March of 1938. The fire also caused damage to sixteen buildings nearby. For 178 years, organized groups of firefighters have battled Houston fires, with the first volunteer bucket brigade established less than two years after the city’s founding in 1836. In a town where wood was (and still is) the most abundant and convenient construction material, structure fires have always posed a serious concern. 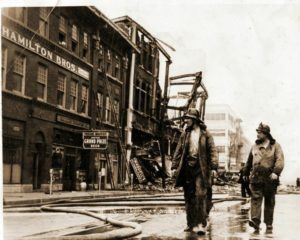 The city’s first major fire in 1859 destroyed all by one structure on a crowded downtown block of wooden buildings along Main Steer between Franklin and Congress, ironically just a year after the first fire insurance policy was issued by a Houston company . . .
As the city grew, so did its fire department. Initially firefighters lived in the stations for fifteen straight days before having one day off – a cycle that kept repeating. By 1991 this had evolved into a four-shift, 46.7-hour workweek, a schedule still in use today. In 1895 the department was composed of forty-five white men. Today the number of firefighters is closer to 4,000, including men and women from many different ethnicities. 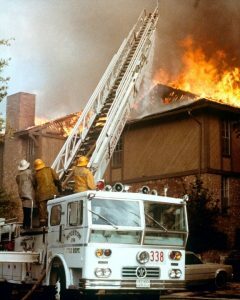 The Woodway Square Apartments Fire in the Summer of 1979 was the first 7-alarm fire in HFD History and brought about the restriction of wood shingled roofs. Click the image for a video clip of KTRK Channel 13 reporting on the devastation. To read the full article click here for the pdf. Tom McDonald regularly records footage of Houston firefighters at work. This short clip is of an apartment fire at US 59 at Collingsworth in 1989.